Chatbots provide retailers with a host of opportunities, from operational efficiencies and enhanced customer experiences to cost saving and intentional selling. Microsoft explores the technology. A new generation of shoppers expect to be able to communicate with the retailer they shop with in the same manner they would talk to their family or friends: online, with immediate responses and at any time of day and night. This is a relatively new customer expectation, primarily driven by the advent of technology in recent years. Nevertheless, it means retail businesses quickly have to adopt new processes to meet this demand. Microsoft has been helping businesses to utilise these emerging technologies in the most useful ways possible. It is working with a number of retailers, including Dixons Carphone, where it is building a chatbot that helps customers to navigate and find what they need more easily. Stuart Ramage, ecommerce director at Dixons Carphone, said: “At Currys PC World, we have a complicated product set. ”We want to help our customers navigate it better online and then get the added value of our expert colleagues in-store, who can answer specific product questions and know how products work best together. Many retailers and hospitality companies are experimenting with the use of chatbots to handle queries from demanding and inquisitive customers. 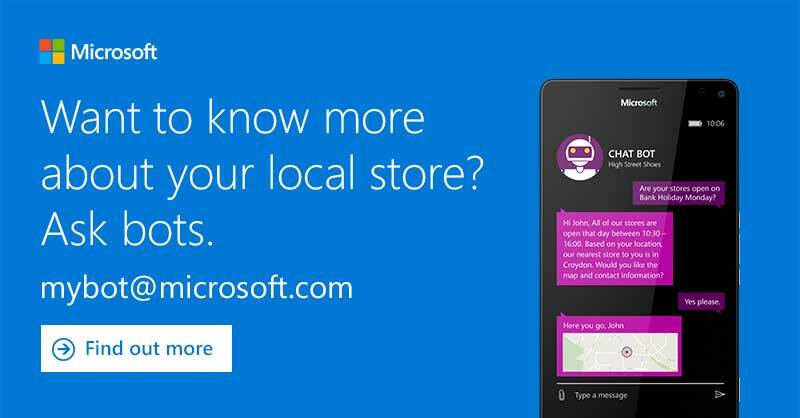 Microsoft has been working with retailers to build intelligent bots that can interact with consumers. This technology opens up conversations between retailers and shoppers on the platforms they use every day, such as SMS and messaging apps from the likes of Skype and Facebook, as well as on the retailers’ own websites. Artificial intelligence-powered chatbots can be used to answer questions and take orders without the need for lengthy online shopping journeys or frustrating customer service phone calls. The detail of conversation is also not lost as it will remain in a shopper’s conversation history, allowing them to go back and recall the answer to their question at a later date. Made.com, Pizza Express and Currys PC World are among the early adopters of the technology, viewing it as a way to get closer to their customers, increase conversions and improve productivity and efficiency. Other businesses operating in the sector, such as Burberry, TK Maxx and Estée Lauder, have used chatbots to help with seasonal promotions. It’s only a matter of time before retailers and brands move from test stage to full-on implementation. The amazing thing is that bots can be taught customer behaviour and company requirements each time they are accessed, ensuring they can provide smart, intuitive and knowledgeable services. In many cases, deployment will see retailers combine the technology with human interaction to secure sales and ensure a smooth service. Imagine the future shopping experience: the bot does the early work to steer a customer towards an online purchase, before a member of staff steps in to seal the deal on the phone or via live video chat if the shopper is identified as a hot prospect. Recent Gartner research, created for marketers, suggests that by 2020 virtual agents will participate in a majority of commercial interactions between people and businesses. It says that brands are investing to build presence in consumer messaging apps, such as Facebook Messenger and WeChat, to reach customers on the digital platforms where they spend a high percentage of their time. This development has fantastic potential to shape purchasing behaviour or ensure customers receive the information they require. It truly provides an opportunity for one-to-one retailing on a personal level. Facebook’s recently launched chatbot technology could revolutionise customer service, online delivery and sales for retailers. Artificial intelligence (AI). Everyone seems to be at it and it’s hard to avoid reading about the topic. Just look at you now.